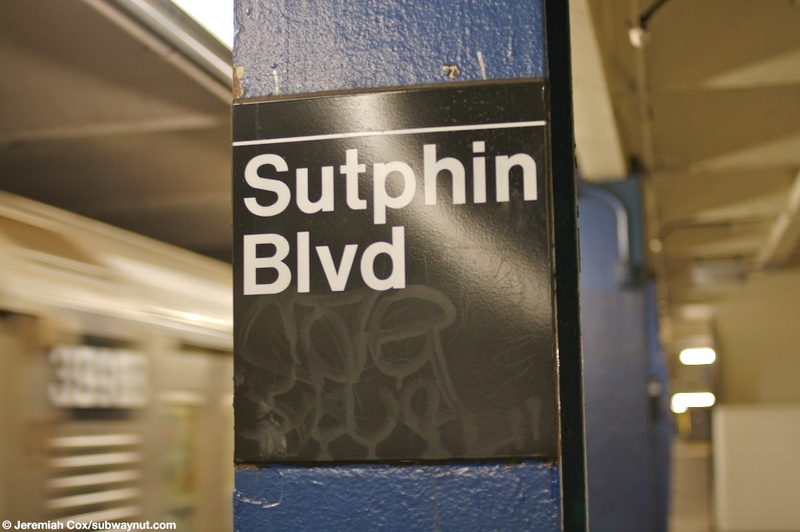 Sutphin Blvd is a typical local stop on the Queens Blvd Line. 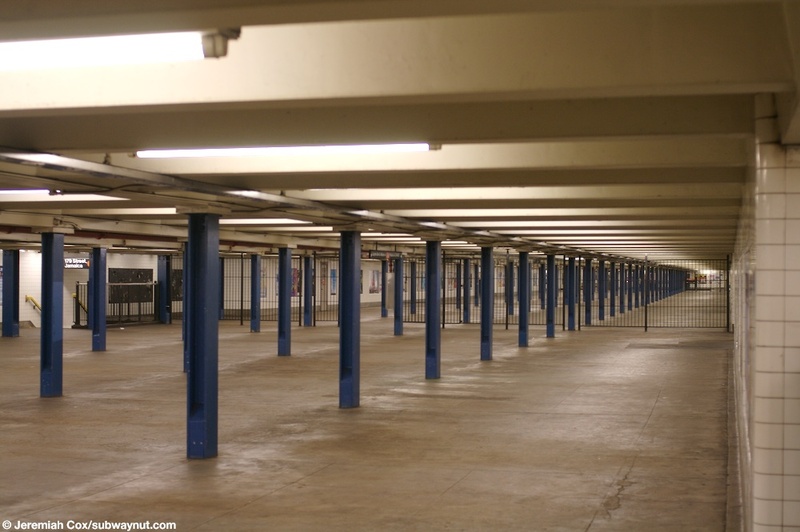 Their are two side platforms for the four-track line with a full-length mezzanine, this is completely intact. 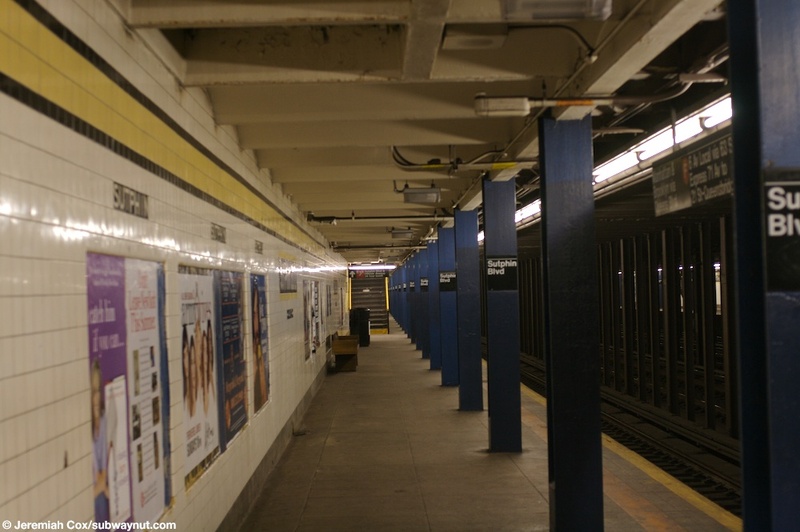 The platform walls have yellow trim with a black border. The name tables are white lettering on black with a yellow border. 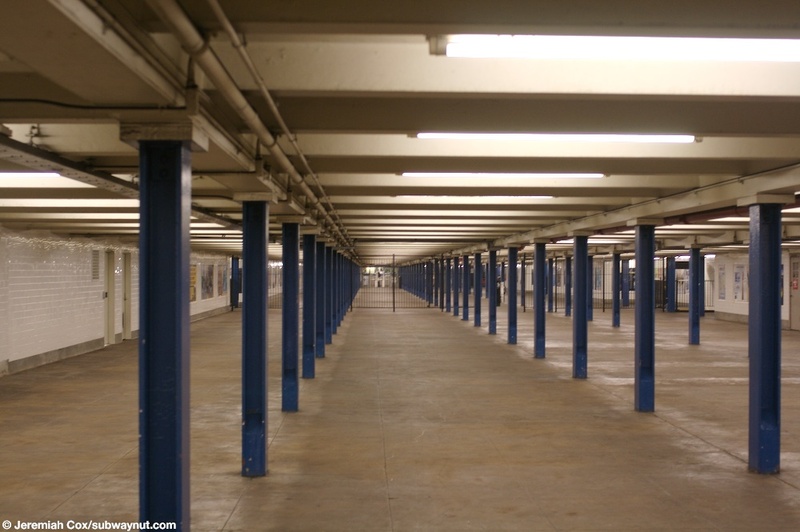 Columns along the platform and the half columns along the mezzanine have been painted blue. 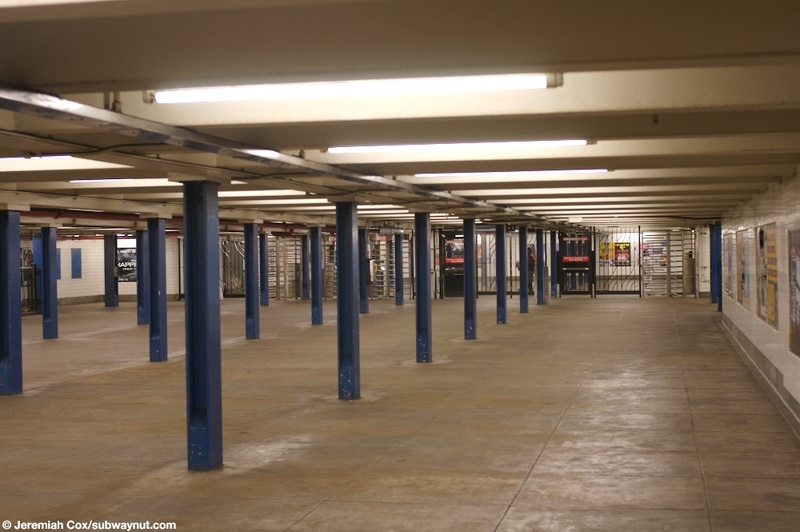 The mezzanine is completely within fare control except for the exits at either end. 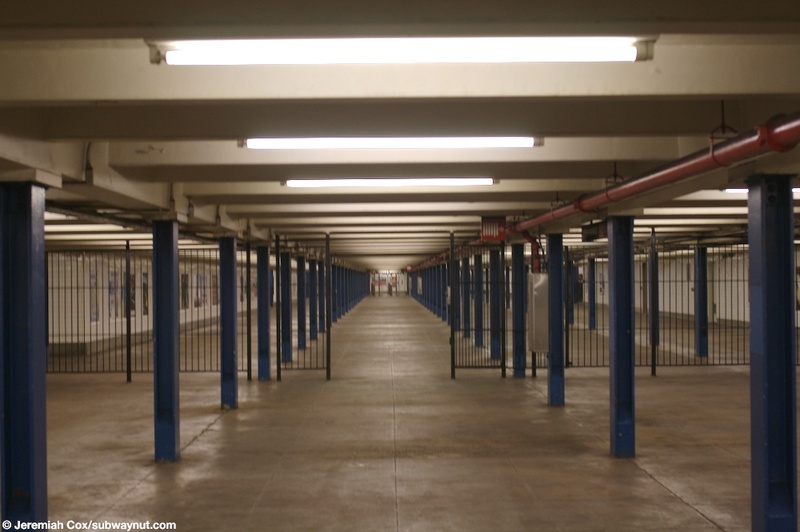 There is a fence in the middle of it with an opening with a now removed gate designed to close off the now unstaffed end of the mezzanine when this entrance was part time instead. 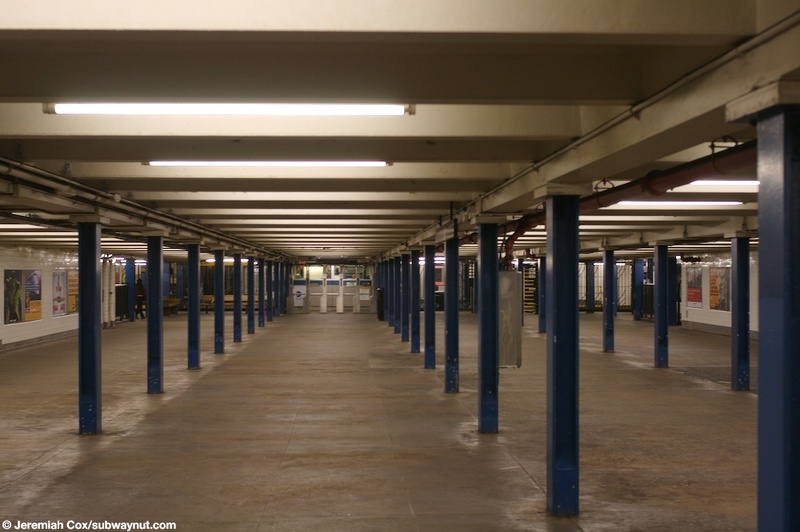 The west (railroad north) end of the mezzanine is to Sutphin Blvd that has the full time token booth. Opposite of the turnstiles there are two addition sets of staircases that lead down to the very ends of each platform, the one to the Manhattan-bound platform is gated up but there is still a mosaic for Manhattan & Brooklyn. 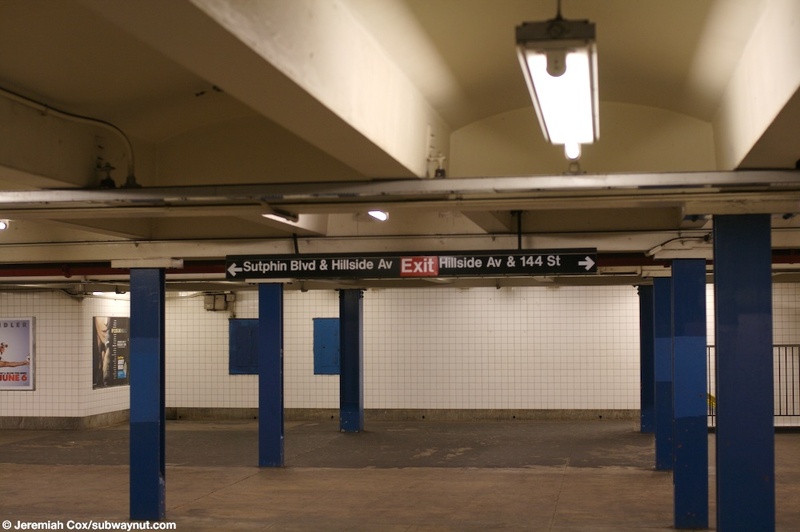 The 179 Street-bound platform's is still usable and provides a little short-cut to those in the front car with a staircase up to a High Exit Only Turnstile. This exit has streetstairs at the SW and SE corners of Sutphin Blvd and Hillside Avenue, along with another at what would be the NE corner of Sutphin went all the way through. 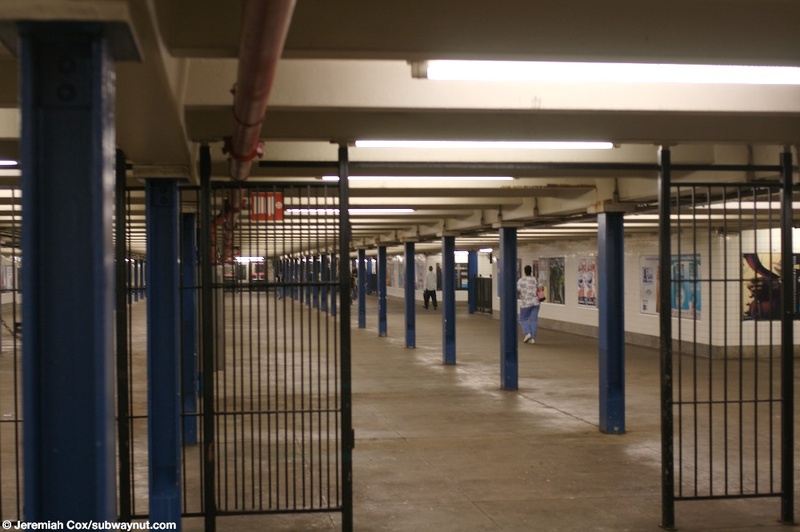 The other, western (railway southern) end leads 144th Street and has a nice wide entrance area but only high turnstiles (and payphone when I visited in January 2012 that had completely fallen off of its base). It has streetstairs to the NE and SW corners of Hillside Avenue and 144 Street. 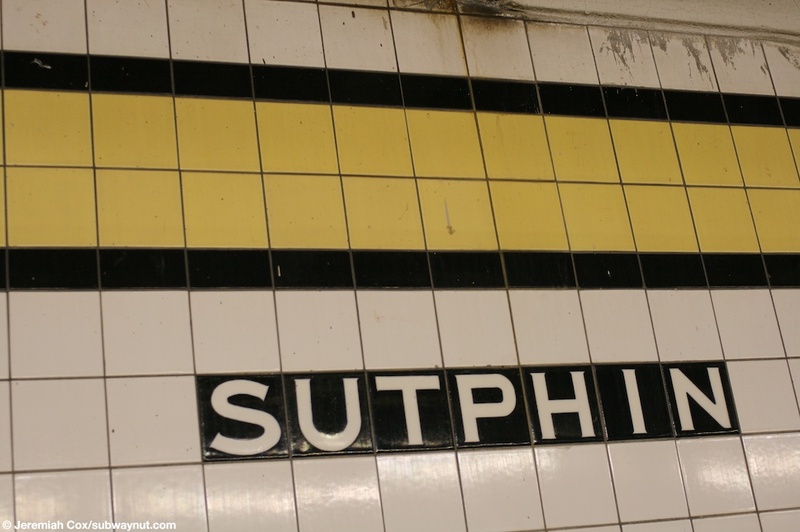 (sutphinf1) Looking out the doors of a train stopped at Sutphin Blvd with name tablet visible as well as a staircase up to the mezzanine towards the exit at Sutphin Blvd. 9 February, 2004 (sutphinf2) A Sutphin Blvd column sign. 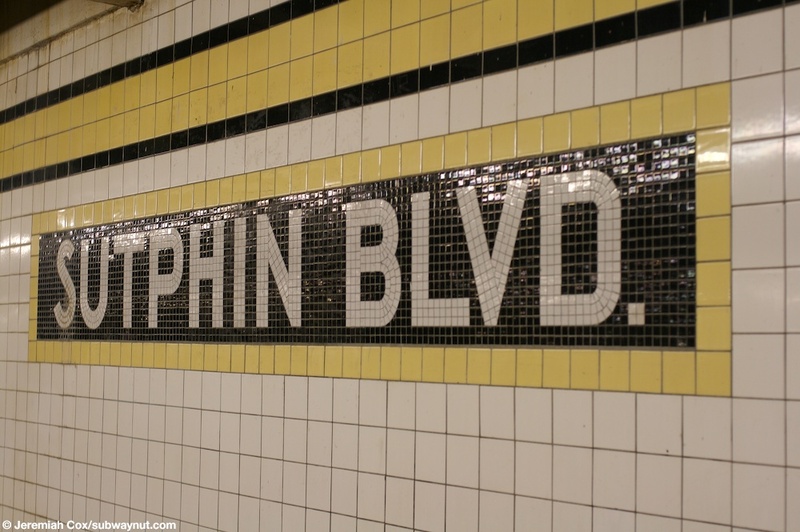 2 June, 2008 (sutphinf3) A name tablet at Sutphin Blvd. 2 June, 2008 (sutphinf4) The yellow trim with the Sutphin text underneath it. 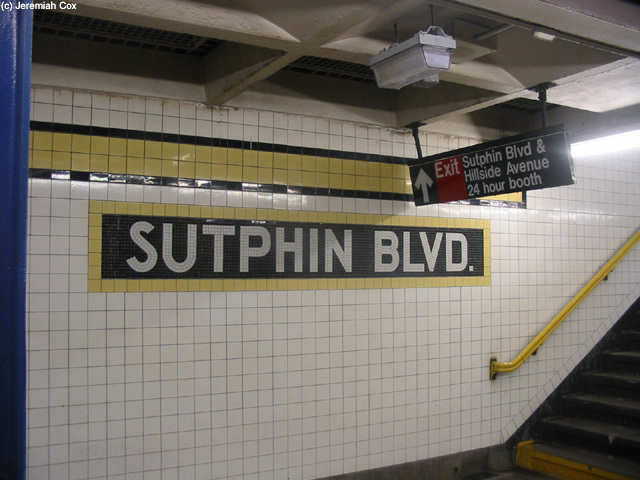 (sutphinf5) A sign on the mezzanine at Sutphin Blvd pointing to the two exits the station has. 2 June, 2008 (sutphinf6) Looking down the long, wide and seemingly endless mezzanine at Sutphin Blvd with the fence in the middle of it visible. 2 June, 2008 (sutphinf7) Another view down the wide and semmingly endless in length mezzanie looking towards the 24 hour booth exit to Sutphin Blvd. 2 June, 2008 (sutphinf8) Another view from the center of the mezzanine at Sutphin Blvd, the exit to 144th Street can be bairly made out. (sutphinf9) A close up of where the gate used to be in the center of the mezzanine at Sutphin Blvd. 2 June, 2008 (sutphinf10) Looking back towards the fence in the center of the mezzanine at Sutphin Blvd at the 144th St end of the mezzanine. 2 June, 2008 (sutphinf11) Looking down the mezzanine at Sutphin Blvd towards the HEETs at 144 Street. 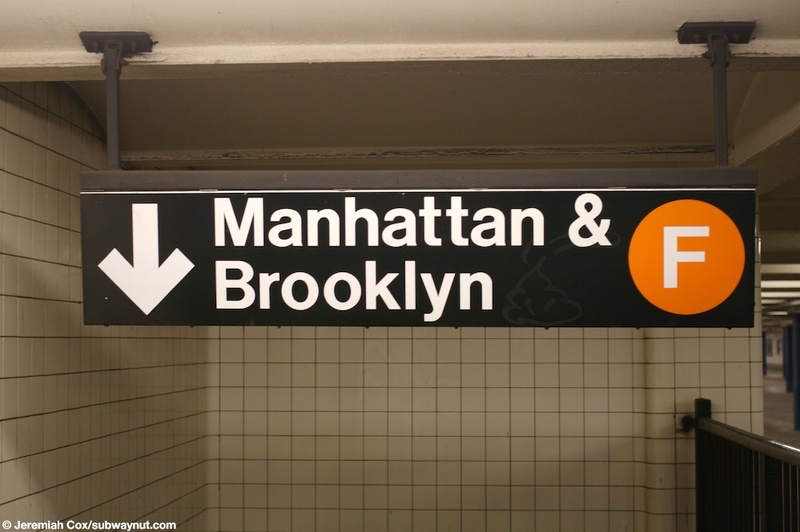 2 June, 2008 (sutphinf12) A generic Manhattan & Brooklyn F sign at Sutphin Blvd. 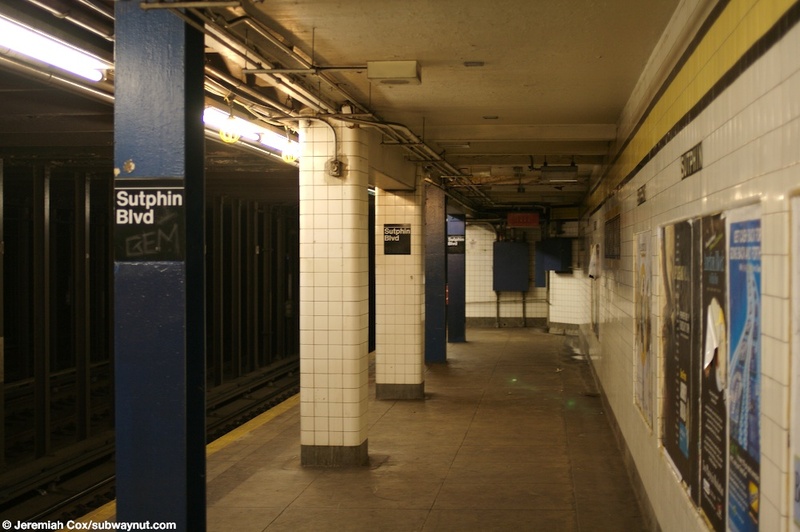 (sutphinf13) A view down the Manhattan bound platform at Sutphin Blvd. 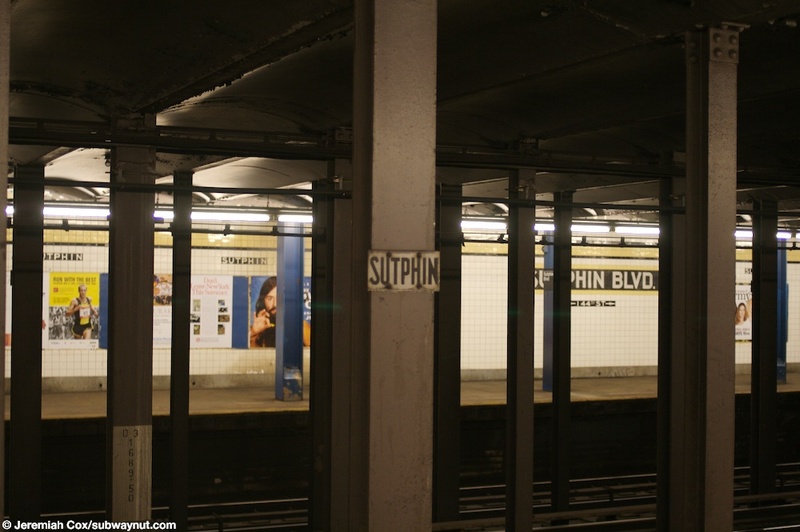 2 June, 2008 (sutphinf14) A small, original 'Sutphin' sign along the pillars between the express and local tracks at Sutphin Blvd. 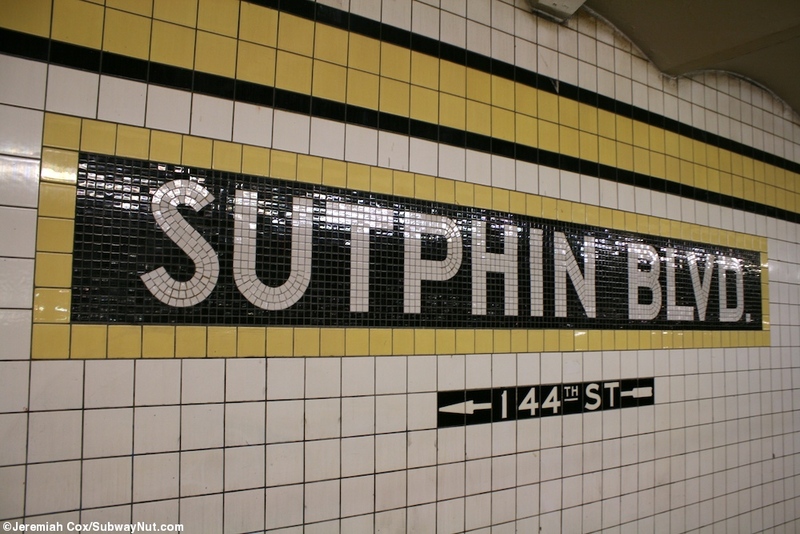 2 June, 2008 (sutphinf15) A name tablet at Sutphin Blvd with the arrowed tiling for 144th St underneath it. 2 June, 2008 (sutphinf16) The very western end of the platform at Sutphin Blvd, there are couple of columns that are have tiling around them.